This course will prepare you for the Oracle Primavera P6 EPPM Certification exam. It will provide sample questions and study guide material to help you best prepare for the 70-question exam. The Primavera P6 Enterprise Project Portfolio Management Implementation Specialist certification recognises OPN members as OPN Certified Specialists. This certification differentiates OPN members in the marketplace by providing a competitive edge through proven expertise. Note: The following information is from the Oracle website. Earn a highly-respected IT credential. The Primavera P6 Enterprise Project Portfolio Management Essentials (1Z0-535) exam is designed for individuals who possess a strong foundation and expertise in selling and implementing Project Management solutions. This certification exam includes topics such as: Enterprise Project Structure, Organizational Breakdown Structure, Data / Coding Libraries; Global and Project Security Profiles; Create and Maintain Project Data; Schedule Management and Analysis, Group and Sort Data, Filters, Roles, Resources (labor, non labor and material); Project Budgeting and Cost Management, Project Portfolio Management; Resource Management, Baseline Management; Project Execution and Control, Project Performance Reporting. Up-to-date training and field experience are recommended. This certification is available to all candidates but is geared toward members of the Oracle PartnerNetwork. OPN Members earning this certification will be recognized as OPN Certified Specialists, which helps their companies qualify for the Primavera P6 EPPM Specialization. 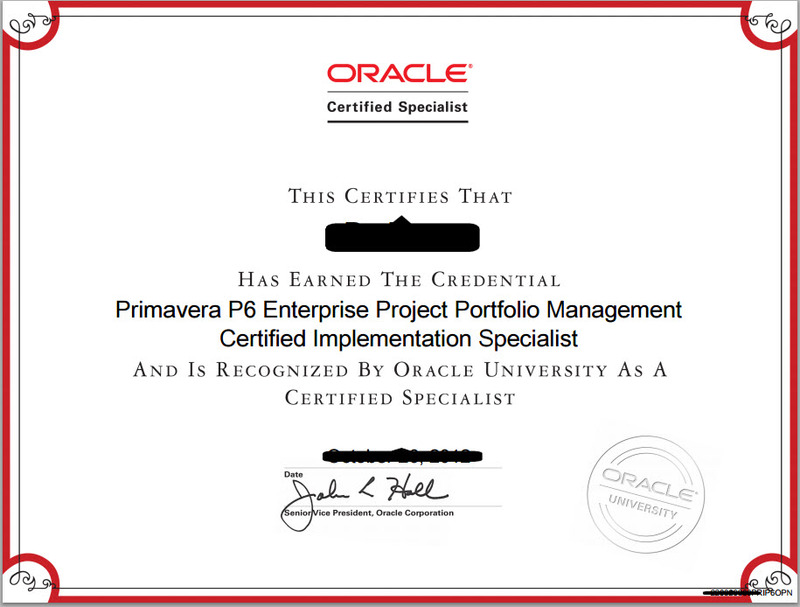 The Primavera P6 Enterprise Project Portfolio Management Implementation Specialist certification recognizes OPN members as OPN Certified Specialists. This certification differentiates OPN members in the marketplace by providing a competitive edge through proven expertise. Booking: Register for exam at PearsonVue or locate a test center near you. Sign up to get immediate access to this course plus more you can watch anytime, anywhere. Subscribe Today! Copyright © 2015 P6 Academy - DC Ltd - All Rights Reserved - Primavera is a registered trademark of Oracle Corporation.